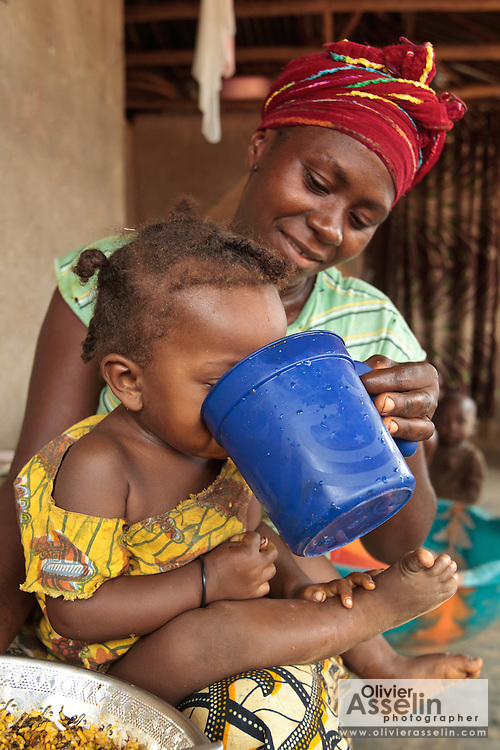 Jenneh Johnson, 31, gives water to drink to her daughter Jusu, 2, at home in the village of Julijuah, Bomi county, Liberia on Tuesday April 3, 2012. Jenneh has been receiving 2050 Liberian dollars (approx. 28 USD) per month since April 2010 through a UNICEF-sponsored social cash transfer programme. She says the money has allowed her to renovate the roof of her home, and send all her children to school. Before joining the programme only two of her children attended school.